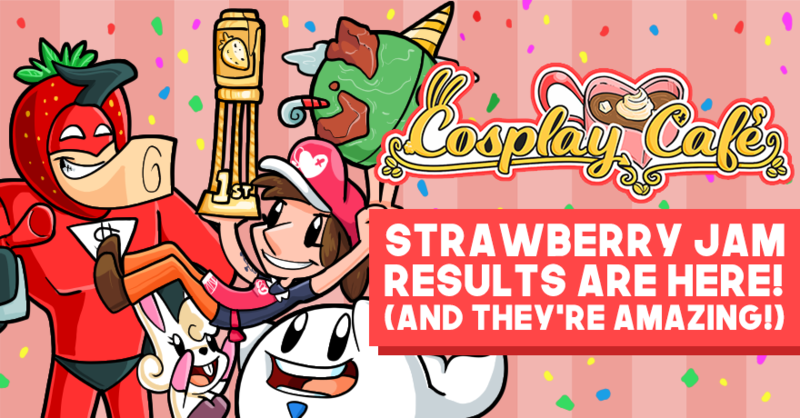 In case you haven’t been keeping up with the footnotes of Cosplay Café, our recently released adult-themed game, the project was developed under the harsh time-frame of a month, as the game was created and developed as an entry for Strawberry Jam 3, a one-month long game jam specifically dedicated to creating adult and adult-themed games. Since the game released two weeks ago, the game has been under judgement together with 36 other entries, all of different genres and thematics, by other jam participants. While it’s certainly a lower number of entries and participants compared to our usual Ludum Dare participation (which normally stack up to a total of 2000+ entries) it’s still a very close-knit community and the feedback and ratings we get from it are just as important! Well, the judging phase is over, and we couldn’t be prouder of our final results! Not only did we manage to grab the first-place Overall. We also obtained the first place in four other very important categories including Play, Harmony, Sound and Aesthetics! We’re also really proud of the third-place in Narrative and would have actually been worried if we had beaten a certain very unnerving and excellent poem. And yes, we got a bit lower in certain other jam-gimmick specific categories like Stealth (don’t play this game with your parents in the room) and Horny (as much as Cosplay Café is an adult themed game, it’s still nowhere as exotic as some of the games around of the jam), but overall, they’re still pretty much fantastic results! These results are heart-warming and validating to us, and we’re really glad we’ve gone through this jam experience. Thank you all for the fantastic support these past weeks, especially to all of the community members over at the Whales And Games server, the extensive feedback from our play-testers, and of course, the Strawberry Jam 3 community that has rated and played our game! Now that its a real game, we’re extremely excited to continue expanding on it, adding new scenes, characters, mechanics and more! We still have a few things to hammer out with WAG before we get into development, but we’re really excited to continue adding new stuff to it and refining its adult-scented thematic. Cosplay Cafe’s Soundtrack is now Available Everywhere, You Animals!